“Sugar Baby Love” is online! This is Sugar Baby Love, the second of 2 Swing-Knitting™ Sock Workshops in English! No previous knowledge in Swing-Kntting™ is needed to knit the socks from the series “Swingy Feet”. You will learn everything you need in the two introductory workshops. After that I will show you some models in various sizes for women, men and children. It will be easy for you to knit those with the knowledge you get here. The Swingy Feet Workshop 2 is 20 pages long, with 50 step by step photos. It is the sequel to Swingy Feet Workshop 1 and takes the knowledge of Swingy Feet 1 for granted! The 1st introductory workshop has taught you that part of Swing-Knitting™ technique you need for the socks. You learned about stanzas and pauses in Swing-Knitting™, and by Swinging a square piece for a sock leg you knitted and learned in one – all the Swing-Knitting™ technique you need for lots of coming socks! 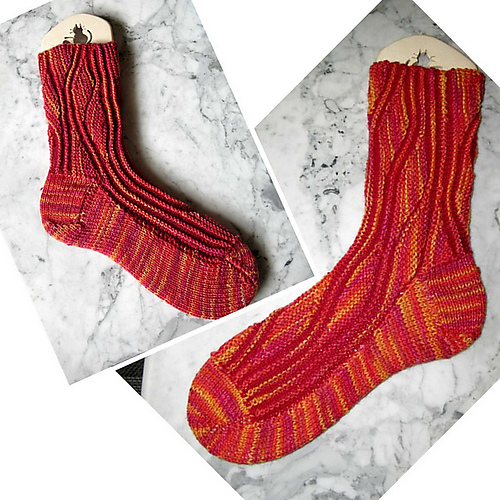 The 2nd introductory workshop teaches how to do the special construction of Swingy Feet Socks. 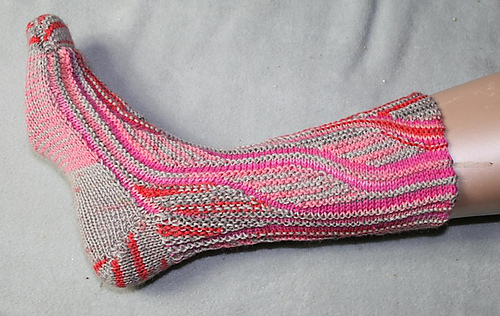 You’ll knit the lower foot and Swing-Knit™ the upper foot, joining both “on the go”. Step by step I’ll lead you through this sock and its Swing-Knitting™. 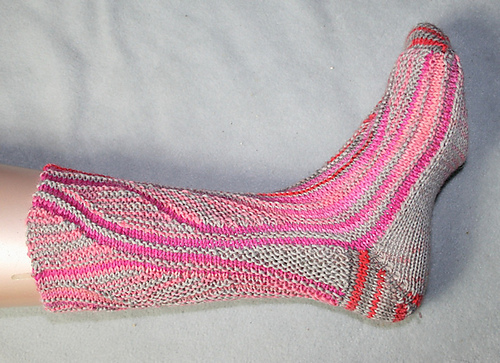 Depending on your knitting needle size and gauge, this sock will be size 38-40 (US F 7 1/2 – 9) or size 40-42 (US F 9-10). With the knowledge of Workshop Swingy Feet 2 you will be able to knit all socks from my German book Swing-Socken even if you don’t understand German. And I’ll give you your own designs – completely new sock models will make music with your knitting needles!